Post-traumatic stress disorder (PTSD) is a mental illness vastly under-diagnosed in children. For that reason, I’ve been guest blogging about the topic at Friendship Circle of Michigan’s website. Previous posts in this series explained why I advocate for children with post-traumatic stress disorder (PTSD), explored 5 myths and misconceptions about PTSD in children, and defined both trauma and PTSD from a child’s point of view. If you’re shaking your head and thinking, “She’s pulling my leg. Those aren’t traumatic events,” then you’re looking at them with the eyes of an adult rather than from a child’s point of view. 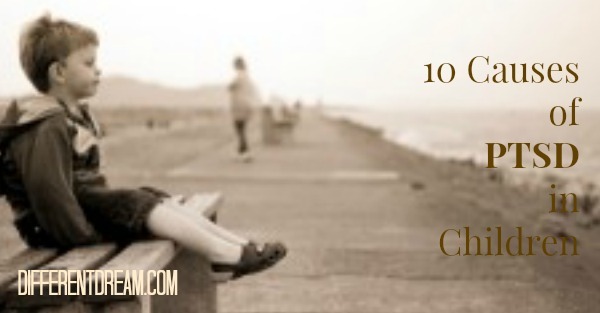 That train of thought and more detailed explanations of each of the ten items on the list can be found at the blog post 10 Causes of Post-Traumatic Stress Disorder in Children at Friendship Circle’s website. *As of this posting, the book proposal is under consideration at two publishing houses. If you’re interested in being interviewed for the book if a publisher accepts the project, please leave a comment. Did you deal with PTSD as a child? 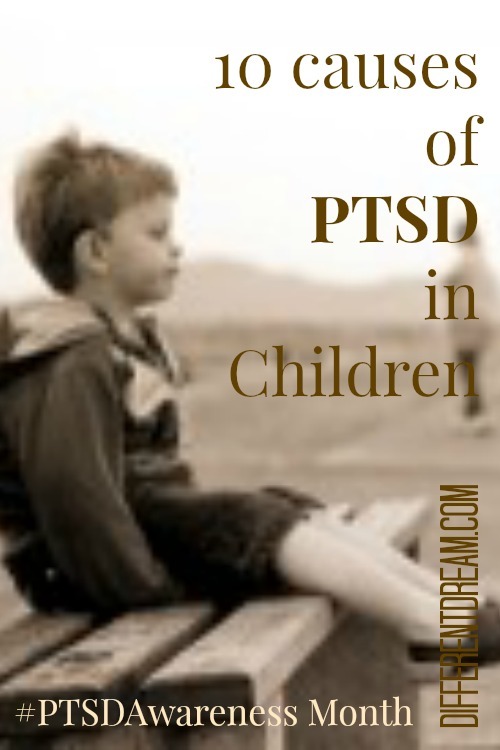 Is your child dealing with it now…or do you suspect PTSD? If so, leave a comment about how the condition was diagnosed and treated. Or if you have questions, go ahead and ask. I’ll try to answer or direct you to resources where you can find answers. Thank you Jolene, for taking the time to read my post and too, for editing it down to the basics…. 😉 I would be VERY open to more info and treatment possibilities, thank you!! Anything you can share will be appreciated tons!! Thank you so much for your feedback and for sharing your story. I read every word, but thought it wisest not to put all of it on the blog for the world to see. I wholeheartedly agree that these little boys are dealing with PTSD and am so sorry about what they’ve experienced. If you want more information about treatment possibilities, please let me know. First I want to THANK YOU for being one of, what seems like, very few who address the issue of PTSD in children and for validating that children DO have FEELINGS and gone unrecognized, they can become very troublesome for these children as adults. Your words are very wise. PTSD is often misdiagnosed as ADHD or bipolar disorder. It also can affect learning because it’s hard for children to focus on new information when they’re constantly on edge, waiting for the next terrible thing to happen. PTSD is more treatable than the misdiagnoses and treatment can minimize learning problems. That’s why I keep writing about this topic–to inform parents so kids get the help they need. Thanks for your well wishes, Wendy, and for the story of your remarkably perceptive kindergarten teacher. The world needs more teachers like her. I am definitely interested in being interviewed for your book if you think a narrative of my experience might be of use. Thanks, for addressing this subject. I see it in a lot of places. Often times another diagnosis such adhd or various learning disabilities mask it. I work with a lot of children who’ve been adopted. They often have the symptoms for PTSD but it seems like it gets missed. Thanks again, for looking at this topic. Thanks for all you do in behalf of kids and parents with regard to children and PTSD. I had PTSD as an infant and child but didn’t know it. My parents did not either. My PTSD resulted from an infant surgery likely done without anesthetic and/or adequate pain control. In kindergarten, I apparently isolated myself a lot. Because of my wonderful teacher, Miss Anderson, I was able to make a leap in healing. She asked my mother in for a consultation, where my mother told her about my difficult beginning. She told the teacher all about the surgery I had and the adjustment period when I got home from the hospital. From this discussion, the teacher created a plan. Every day she sat me with the same 3 children for snack. I don’t remember, but my mother tells me that I was able to begin to socialize with the other children. Funny that the only thing I can recall about kindergarten is doing things alone or with the teacher or with the group and the teacher leading. But I also remember loving kindergarten so her intervention saved me. More parents and teachers need to know about PTSD in children. Good luck with getting your book published. I will be sure to advertise it on myincision. Perhaps you could do a guest post about it. You are most welcome. I’m sorry to hear your daughter is still struggling with PTSD and the accompanying anxiety. Her story is one reason I write about the subject and am trying to get a publisher interested enough to pick up my book project.